The black and white photo is beautiful! Nicely taken Rajesh. Not quite through the keyhole! A very interesting shot. You share some of the best of your world. What a fine, creative composition and it works very well in black and white! Well-done! Beautiful shot. I like how you've framed it. Rajasthan is so rich in heritage. 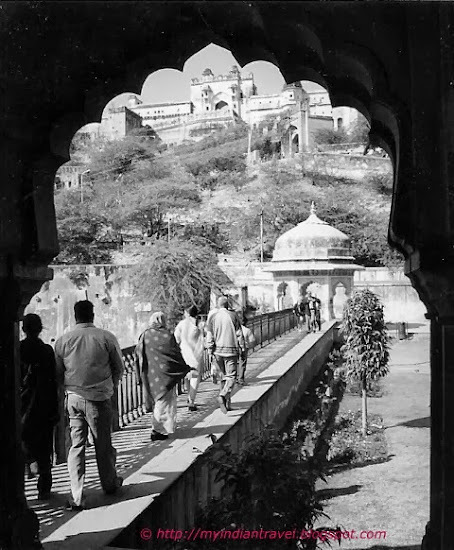 The black and white pic has brought out the mystique beauty of this heritage. I love the way you've framed this. Great shot. Wonderful framing . Great picture. A great B&W contribution, well composed! Beautiful composition in an exquisite frame. Great shot! I like this wonderful frame! Such a nice footbridge going over to the center. Lovely composition. Terrific shadow shot for the day, Rajesh, as always! Love the B&W and your composition!! Enjoy your weekend!! The photo is perfectly framed by the opening. Nicely done in B&W, too. I like your PoV, it makes a wonderful framing to the motive! So beautifully framed, I love this! Your photo is very dramatic and I love the frame. A very interesting photo. I love the frame.